I don’t tend to write much here about what I feed my son. This is very much a deliberate thing. Nutrition is a minefield at the best of times but talking about feeding kids is, in common with 97% of all parenting related matters, just so intensely political that I vowed not to do it here. It’s not that I don’t have an opinion on it. I have an opinion on everything. But, as fun as I am sure it is, I didn’t really fancy arguing with strangers on the internet in my spare time. (And, I mean, it must be fun right? Why else does the Guardian’s Comment is Free section exist?). I figured though (no doubt recklessly) that advocating the inclusion of vegetable matter in a child’s diet probably wouldn’t send the internet parent trolls into some sort of frenzy. But even it is does (and no doubt my wanton use of olive oil – OMG, an Omega 6 fat! – and a little plain flour will offend at least 78% of my local Whole Foods Brigade), it doesn’t really matter because a) I don’t really care and b) while these did just happen to be what my son ate for tea tonight, they are good enough to warrant inclusion here as an adult foodstuff. More so, of course, if spiked with a bit of chilli and a boatload more seasoning and eaten with a garlicky yoghurt sauce or maybe with an (also garlicky) tahini dip. For what it is worth though, if you are a parent struggling to persuade your offspring to partake of their 5 (or 7, or 10, or 18) a day, these little bad boys are a winner. (Can I just say that they aren’t in any way a winner when it comes to the iPhone camera? It quite literally has no idea what to do with the colour purple and so my pictures in this post veer from fluorescent horror through to washed out tourist menu snaps. I tried Instagram and it made it worse. Hence the oddly cropped yellow beetroot from a decent picture I did manage to take at the top of this post. I can only apologise). You can fiddle around with the choice of vegetables here to suit you/your child/your husband/your mother-in-law. These started life as a fairly traditional courgette and feta fritter but have morphed over time depending on what I happen to have in the fridge. The beetroot version has become a more regular fixture now because my son, being a two year old boy, thinks purple food is mind-blowingly awesome. Which I think he gets from me. 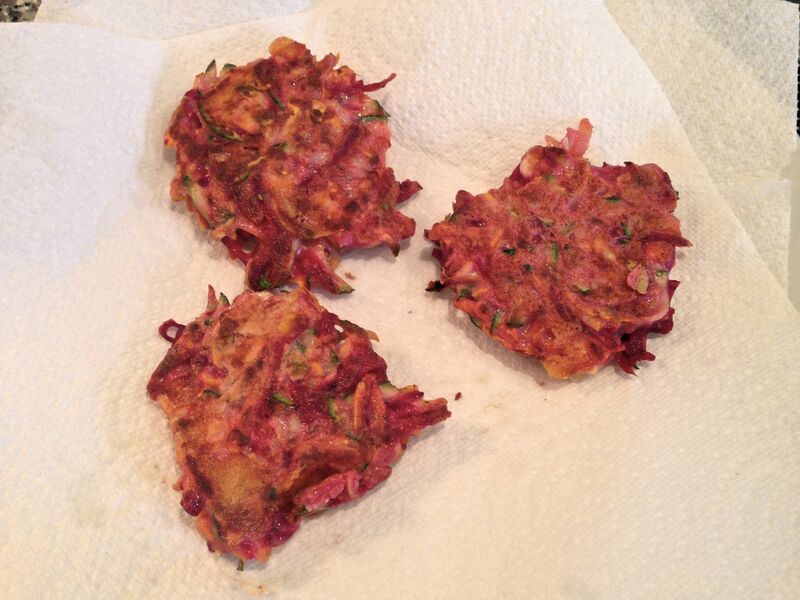 Plus, we all know that beetroot is really good for us and, more importantly, carrots and beetroot throw off a LOT less water than courgette and therefore somewhat reduce the drying/draining hassle that unfortunately cannot entirely be dodged on any vegetable fritter making adventure. 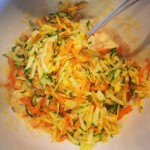 But any mixture of courgette, carrot, beetroot and/or sweet potato would work. You can also add some other chopped vegetables like broccoli or cauliflower (the latter would be detected at 600 yards in our house no matter how finely it were diced so I have never actually tried it) but I do think the majority of it needs to be a starchy grateable (I don’t think that’s a word) vegetable to get the right fritter texture you are going for. The feta can also be replaced by grated parmesan, or even cheddar, if you think that is less likely to get vetoed. Children are, after all, basically China in the UN Security Council of all matters of cuisine. And with that I shall say no more about feeding children. (But if it’s something you’re into – willingly or otherwise – I’d recommend checking out Claire Thomson’s 5 o’clock Apron twitter feed or her Cooking For Kids Guardian column for brilliant ideas). The key, in my mind, to a successful fritter is having as little ‘batter’ as you can possibly get away with. Something that looks like a fluffy American-style pancake with some vegetables floating in it is not what we are going for here. These really just have enough egg and flour to stop them completely disintegrating when you cook them and result in a fritter that is (or at least seems) like 98% crispy vegetable. And cheese. Let’s not forget the melted cheese. There is actually a second key. You must have really quite dry vegetables. This is a bit tedious, especially with courgettes, but if you don’t get them dry enough you get soft spongy fritters rather than excellent crispy fritters. Make sure you give them a really really good squeeze in a clean tea towel after grating and then lay them out on some kitchen paper for as long as you can (half an hour ideally) to let any excess moisture evaporate. And when you fry them don’t be tempted to try and flip them too soon or generally prod poke or otherwise interfere with them as they will disintegrate otherwise. Leave them on the first side for a good two minutes (time it, it’s longer than you think) and then, once they are nice and brown on one side, they will flip beautifully. So I suppose that’s the third key to a great fritter. (Yes, this is turning into the Monty Python Spanish Inquisition sketch. But nowhere near as funny). This is my recipe, which owes a great deal of thanks to each of Nigella, Smitten Kitchen and Leiths as I have made each of their respective courgette fritters and this is the terribly bastardised version that gets an outing in our kitchen nowadays. By all means look at their original recipes. They are the professionals after all. If you have inexplicably just scrolled to the bottom for the recipe, you are reading the wrong food blog there is some stuff about fritter perfection, substituting ingredients and cooking in the section just above so I’m afraid you’ll have to scroll back up for those. I have just thought to add that spelt, wholewheat or even gluten-free flour (if you’re that way inclined) would probably be fine here too as it’s just a binding agent. The wholewheat might alter the flavour (very) slightly though. I usually make this with spring onions that go straight into the mixture but if you don’t have any it also works with regular onion, albeit you need to sweat this down with some oil until soft before adding to the mixture. In the recipe below I would substitute half a small onion, finely chopped. If you have a food processor with a grater attachment, all the better but a box grater works perfectly well and isn’t that labour intensive for this quantity so you may decide that the processor washing up isn’t worth it. If you were scaling up though I would deploy the Magimix, as grating endless courgettes is quite boring. Cook these in batches – they need space to fry (rather than steam which is what will happen if they are too close together in the pan). They really don’t need to be served piping hot – and are better when allowed to cool slightly anyway – so do a few at a time depending on how big your pan is. This makes about 9 small fritters (7-8cm diameter), which would probably feed 2 adults as a light meal with a salad or something or 3-4 small children. I would have done a smaller quantity but that would have meant halving a beaten egg which I think we can all agree is a most joyless task. 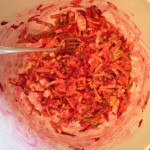 300g beetroot, carrot and courgette (in whatever proportion you like), grated and squeezed very dry. Start with your vegetables – grate (by hand or in a food processor), squeeze well and leave to dry on kitchen paper for as long as possible. 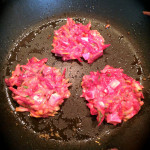 If using beetroot, keep it separate from the rest for now as otherwise everything will be pink by the time you cook it. In a large bowl, mix together the feta, mint, lemon zest, spring onion (or cooked regular onion), chilli powder (if using) and flour and mix well. Add the beaten egg, and stir together. It will look pretty horrible. This is fine. Stir through the grated vegetables. It will not be a smooth batter by any means but just make sure everything is well mixed. Season aggressively with salt & pepper. Heat a couple of tablespoons of oil in a large frying pan. Once hot, dollop a tablespoon (no more!) of the mixture into the pan and press down gently to flatten the mixture out. Cook on the first side for at least two minutes and then, if it is nice and golden, flip over and cook for another two. Remove and pat dry on some kitchen paper while cooking the next batch. These sound great. I reckon I could give these a go and my 6 year old might just go for them!